When I have the opportunity to do some drawing, pencil and very smooth paper are my tools of choice. And if I am at school, students always make the best models. At this time of year, as we near the end of the semester, they don’t move that quickly — they are either studying or napping in the cafeteria, and almost always have their hats and coats on. I’m not quite sure why that is. I have students that will go through a full two hour class in a heated room with a parka on. Do you get that? Contour drawing is the best method for me to capture gesture quickly. I think Charles Reid says it best: “Ideally you’ll concentrate on shapes, connections and the angles and distances your pen will travel to create a new shape.” He also gives three tips for his kind of modified blind contour drawing: Keep your eye on the subject, keep your pen on the paper and use a single line. I took some liberties with this wise man’s advice, but I still enjoyed the gliding motion of my pencil on smooth paper as it followed the contour of the subject. Sketched in a Stillman & Birn Zeta softcover book. 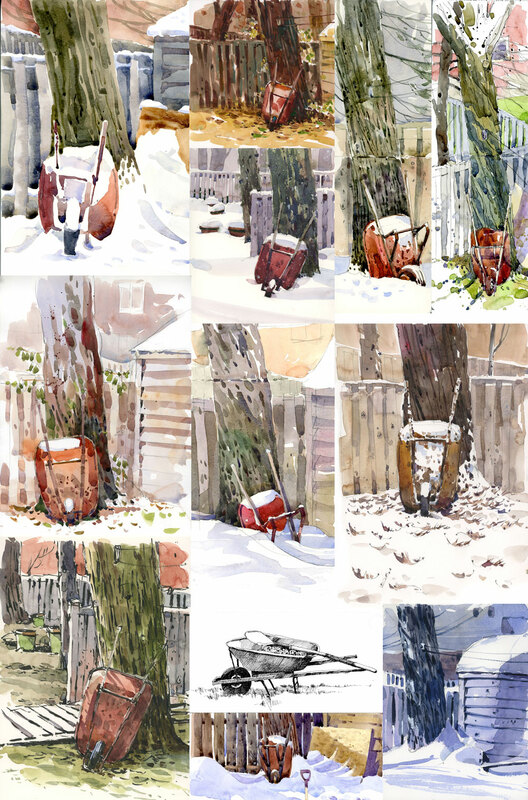 I thought it might be a nice idea to offer prints of my watercolours for the holiday season. So if you are thinking of buying yourself or someone else a gift in the next few weeks, have a look at the print shop I just opened on my website. I’ve chosen some of my favourite watercolours and made them available as large, signed prints. These are printed on archival quality paper with light-fast ink on 13” x 19” acid-free 260 g/m2 100% cotton fibre paper, and shipped to you in time for the holidays. You’ll find 20 of my favourite paintings in the shop, but I can also accommodate custom orders so if there’s something you like and don’t see in the shop, just let me know. The wheelbarrow in a dark corner of my garden always comes alive in winter. I raced home from work today to sketch it, hoping the sun wouldn’t melt the little bit of snow that was still on it. I was in luck. While I sketched, I had a great conversation with Rob, who is painting a few rooms in my house. We compared painting notes, both on walls and on paper, and I told Rob that I had been painting this wheelbarrow for years. And then I started thinking about how many times I had painted it, which led me to counting the sketches in my files. I found 17 wheelbarrows in all, and there may be even more if I look at little harder. Here are a few I have done over the years. As you can see, I do more sketching than gardening because I could only find one sketch of the wheelbarrow in use. I used to hate winter until I started sketching it. Now I find myself looking forward to it. So much so that when it snowed overnight I briefly contemplated calling in sick today. I even imagined the perfect day I might have — my sketch supplies piled into the car, a mug of coffee in the cup holder, a series of stops at my favourite sketching spots. Perhaps a break for lunch in a café, with a view of more snow. But then I came to my senses, remembered that my students had projects to finish, and reluctantly de-iced my car before the long drive to school. 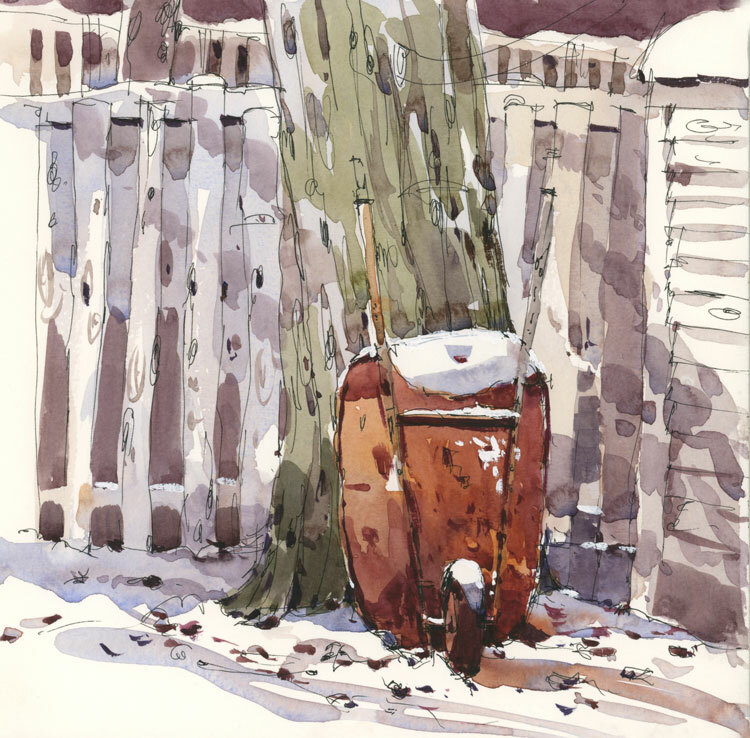 Sketched in a Handbook watercolour journal, from a window at school during a break. A few weeks ago I posted an oil study (below) that I’d done in class of a scene in West Yorkshire near Haworth. I’ve been working on a larger version of the scene for the past two classes, and thought it would be interesting to post the larger painting too. The sketch is 7″ x 9″ but for the larger painting I chose a 12″ x 12″ wooden panel, and this time I expanded the scene to include some foreground. I’m not sure I’ve completely finished, but I took a phone shot of the painting before I left the class last night. Of course I can’t carry these paintings home because they’re still wet, but looking at the photo during the week is a good idea because it helps me find things I might want to work on during next week’s class. Back in July, when I was looking at this scene and taking a photo for what would eventually be the reference for the painting, what I found really magical was the light on the distant hills. When I expanded the composition to include a larger foreground area, I chose to keep the lower part of the painting fairly soft so as not to compete with the upper part where I think all the interest is. We’ll see where this goes next week, but besides adding a few dabs here and there, I may leave it as is and move on to something else. You have to look pretty hard to see colour in the landscape today. At first glance it’s all grey but then you notice that some of those greys are greenish and some are reddish. In fact, it’s such a dreary day that even at 3 p.m. I could have used a headlamp to paint from my car. When the colours are that subtle, I use a limited palette — this time Cerulean Blue, Organic Vermillion and Hansa Yellow Medium. The mixes that I get from this primary triad of colour are both muted and granulating. Sketched on a block of Fluid CP paper, 8″ x 8″. I’m not really sure how many times I’ve painted this panorama of Montreal from a window at school. I’m guessing about 10, so I used that in the title. It’s at least that many, if not more. This is a view I can only paint it in the late fall and winter when the leaves have fallen from the trees and I can actually see the mountain. Every year as the branches grow, more and more of the view is obscured, and eventually I’ll have to stand on a crate to paint it, but it’s a place I love to set up at. Besides the window ledge that is perfect to paint on, the nearby stairwell makes it a great spot for students to gather, so I I end up spending some time chatting with anyone who looks over my shoulder.